For tea people, the brazier is packed away by the 1st day of the 10th month of the lunar calendar (Northern Hemisphere). One may also wait until the first day of the boar in the 10th month to pack away the brazier. On the same day, the hearth is opened for the first time in 6 months. This is in line with the traditional habits of laypeople. Through the warmer days, families would use braziers so their houses would not overheat. In the cooler time of year the household would change to using a hearth to warm the house better. In the hour of the boar, on the day of the boar, in the month of the boar there is a tradition of eating mochi rice cakes. (The hour of the boar is between 9pm to 11pm (though translated ‘hour’ one ‘koku’ is equivalent to 2 hours in order to divide a day into the 12 signs of the Chinese horoscope. The month of the boar is the 10th month of the lunar calendar.) The boar symbolises many children and family prosperity. The ancient Chinese folk tradition of marking this day by eating mochi aims to benefit from the auspicious symbolism of the boar. In Edo Period Japan, a tradition emerged of preparing the kotatsu (covered table with a heat source underneath) on the day of the boar in the month of the boar. This is influenced by the sign of the boar being strong yin in the ancient Chinese feng shui system of yin yang and five elements (inyō gogyō 陰陽五行説). Strong yin is strong aqueous, or water essence. 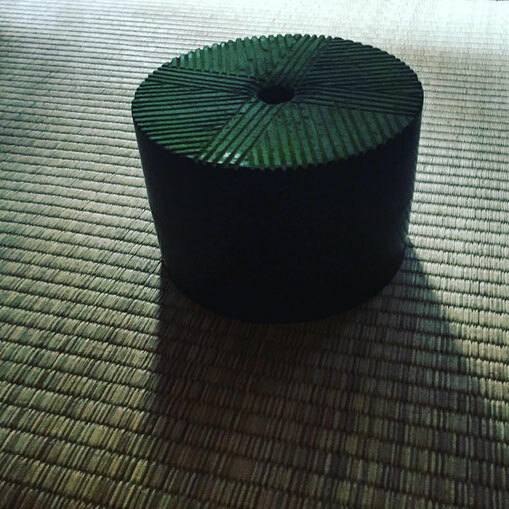 This property of the day makes it auspicious for avoiding fire calamity - useful when dealing with the kotatsu and the hearth (which involved fire) for the first time in 6 months. These are still used in some places. Other companies use metric. According to past records, twenty monme (about 75g) of tencha was packed into individual paper envelopes (tencha 碾茶 = loose, steamed matcha grade leaf tea - to be ground into matcha). There were different grades of tencha divided among multiple envelopes with different peotic names to identify the tea. In the Momoyama Period ‘hantai’ (半袋) containing 10 monme (about 40g) become the normal unit of measurement when packing tea. There was also a ‘kohantai’ 小半袋 which is 5 monme (about 20g). The largest chatsubo (tea jar) contained 7.5 kin of tea, of which 4 kin was ‘seikou’ 清香 or loose leaf tencha (1斤 1 kin = 160 monme). The standard amount of a single serve of koicha (thick tea) in the past was 4g, now it is 3g per person. Usucha thin tea remains half the koicha amount for one person. Harvested tea leaves are first steamed, then dried in a ‘hoiro’ tea dryer. Leaves to become tencha are not rubbed. 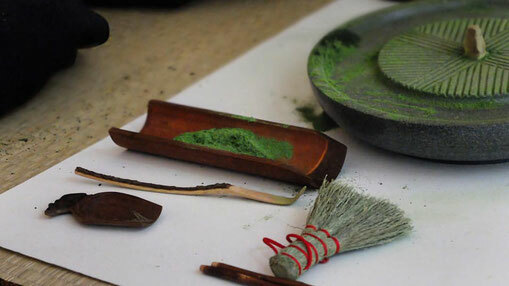 By contrast, leaves to become gyokuro are rubbed and dried. 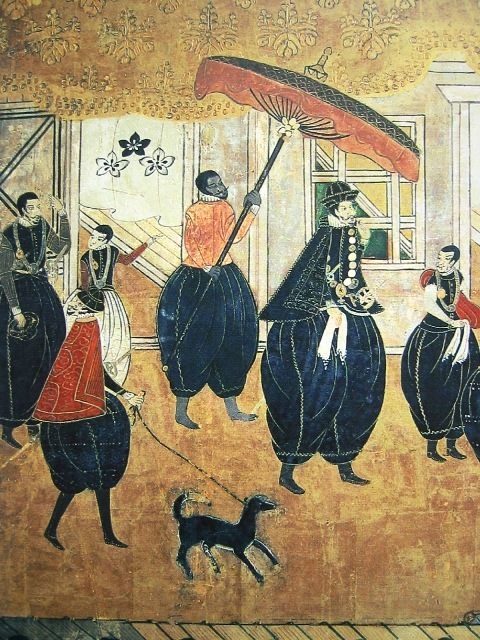 - First appeared in early Edo Period (first half of the 1600s). - The 2nd of May is ‘hachi jyu hachi ya’ or ‘eighty-eighth day from the beginning of spring’. Ten days either side of the eighty-eighth day from the beginning of spring gives a total period of 21 days. Tea is at its best for harvesting in this period of 21 days. The character 昔 used in tea names is a combination of the strokes used in '21st' or 二十一日 in Japanese. Tea picked before May 2 is called ‘hatsu mukashi’ 初昔 (first period of the 21 days). Tea picked after May 2 is called ‘ato mukashi’ 後昔 (later period of the 21 days). In the Edo Period, the highest grade matcha had the name ‘hatsu mukashi’. Next was ato mukashi. During the 3rd Tokugawa Shogun Iemitsu’s reign 1623 -1651, daimyo passionate about tea started to demand ‘white tea’ from Uji Tea producers. The character ‘白’ (shiro, or ‘white’) in tea names is a vestige from this period, however the precise meaning of ‘white’ as it was used at the time is unclear. There are records of Oribe preferring 青茶 aocha ‘green’ tea, and Enshu preferring 白茶 shirocha ‘white’ tea. One theory as to how the word ‘shiro’ (white) became associated with the highest quality tea comes from the fact high quality tea ground between a tea millstone very fine powder gradually slides out from between the millstones in a vivid white colour. In contrast, lesser quality tea has a dark green colour. Tea that is not ground finely enough forms a course powder and falls from between the millstones rather than slide out in a fine powder. This course tea has an even darker green colour. Another theory is that 'shiro' referred to differences in the process of steaming the tea leaves after harvest, resulting in different colours in the tea. A widely accepted explanation of 'shiro' among producers is that the young leaves of the first harvest of the year produced a light, airy tea of slightly white appearance. Importantly, 'shiro' referred to the preferred matcha drunk in Song Dynasty China. There are efforts to reproduce shiro (white) matcha in China today. 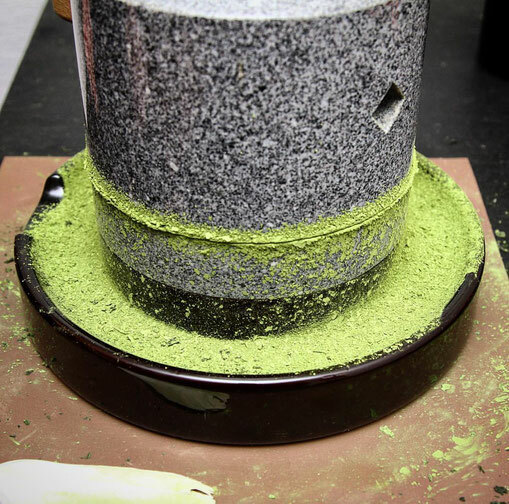 The stone from Asahi-yama in Uji has been considered the best stone for tea millstones since ancient times. The Ueda clan under the Asano clan uses the tea producing family Kataoka Dōni 片岡道二 for their tea. The Kataoka Dōni family is one of the 14 tea producers that regulated tea for the Shogun. 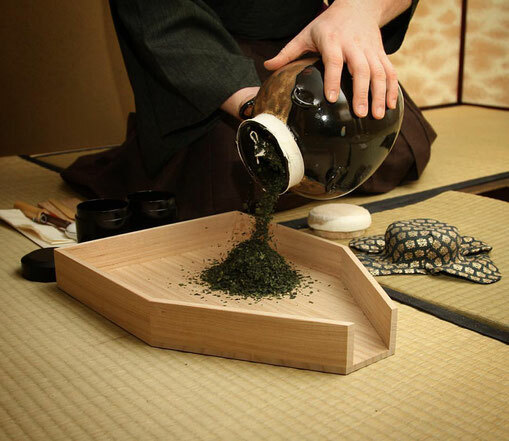 As the methods of storing tea have advanced since the Momoyama Period, after fresh tea is produced in modern times it is refrigerated immediately rather than stored in a ‘chatsubo’ ceramic tea jar. Refrigeration enables fresh tea to be stored from May and packed into a chatsubo in October, right before the kuchikiri chaji (tea jar opening ceremony) is traditionally conducted in November. The tea is prepared, refined and then packed into a tea jar all at once, filling the jar to the brim. When packing tea into a tea jar, first the tea jar is heated from the inside and outside to remove humidity from the tea jar. Without allowing the tea jar to cool down and gather humid air once again, the tea jar is packed immediately while the inside air is dry and hot. Some leaves are left in the tea jar while it is being warmed. These roasted leaves without moisture are removed and used as the initial seal at the mouth of the tea jar (after it is filled with fresh tea). Then paper is layered beautifully over the mouth and glued to seal the tea jar. Finally the maker stamps his personal seal on the paper, identifying who prepared the tea. Tea jars are stored through the heat of the summer at a (Buddhist) monastery at the top of Adago Mountain (愛宕山). This is a place famed for its cool climate and lack of humidity. The monks of the monastery look after the tea jars with care not to disturb their contents in any way. Then the jars are distributed to buyers in October, the month the cold starts to set in (the 9th month of the lunar calendar). There are also people who dig a dry well with an air shaft and suspend the tea jars in the cool circulating air of the underground well. This method aims to even better keep the flavour and colour of the tea well. On the day of the opening of a tea jar, quite a solemn ceremony and feast is conducted. 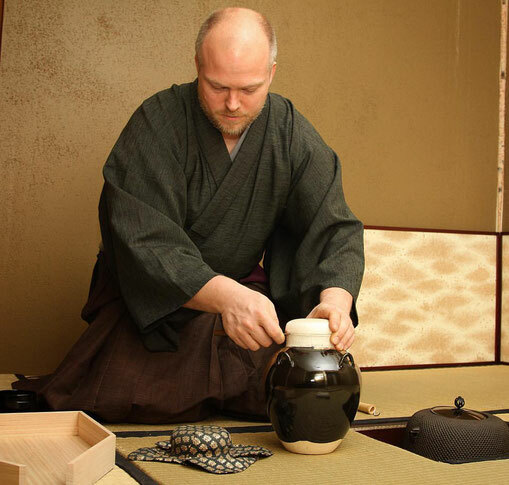 The tea master shows his reverence through such a ceremony and invites close friends and associates, as well as the most influential people of the region. A 'kuchi-kiri' (cutting the mouth) chaji is a formal tea gathering to celebrate the opening of a tea jar. The papier-mâché that seals the mouth of the tea jar is cut in front of guests and the guests get to select the tea they would like to enjoy freshly ground, from the contents of the tea jar (chatsubo). After the initial formalities opening the jar, the guests are served a light kaiseki meal. 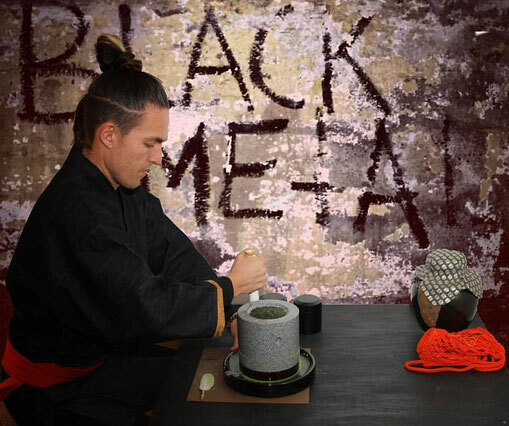 During this time, the host grinds the tea in a millstone in the adjoining room. The guests enjoy the sound of the millstone while they eat, in expectation of the first fresh tea of the year.